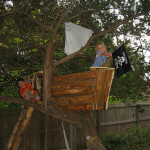 Marcus built this special treehouse for his children who love pirates and maybe they had the desire of being one of them! “We built our treehouse in our backyard in some cedar trees. We live in Kerrville, Texas, I began the treehouse thinking it would take a weekend. Of course it took a month instead! My friend had extra scrap lumber that he was looking to get rid of, so he unloaded it our yard and I got to work. 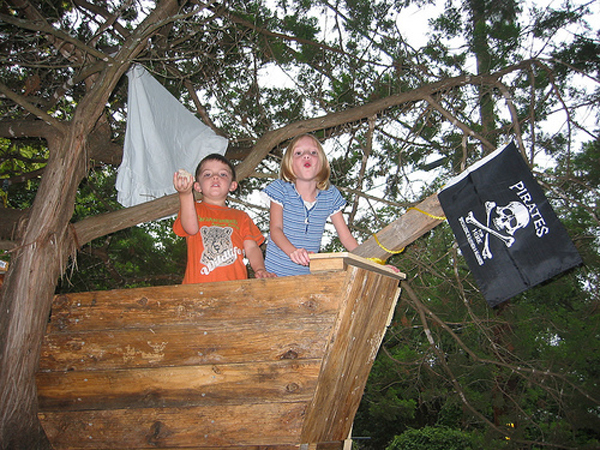 My kids were much younger at the time–3 and 6–and both of them were obsessed with pirates, so naturally, we made a tree house shaped like a pirate ship! Why a pirate ship? Because we love pirates. 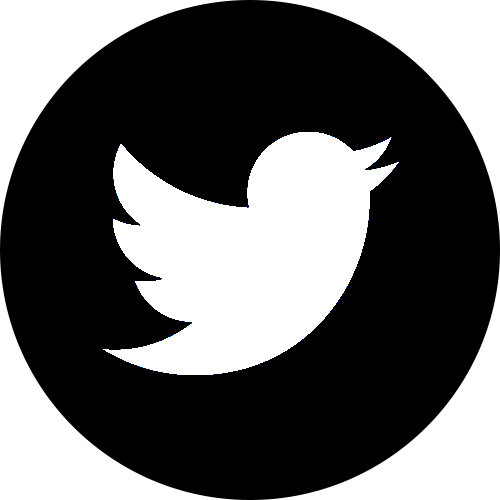 It was a simple theme to implement really, inspiring small elements of the design. We included a sail, decking, a prow, a flag, some hammocks (underneath the ship “below deck”), and some rigging. All of this makes it sound much more elaborate than it is. 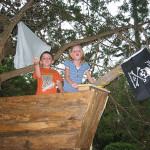 But a kid’s imagination doesn’t need much prompting to turn a themed platform into a real pirate ship. 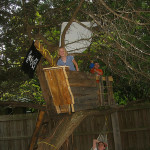 The function of the tree house is simple: a play space for the kids, and a hammock for the parents while the kids play. There are no rooms. It is really a simple affair, a platform supported by 4×4 posts on two sides and the tree itself on the other two sides. That’s about it! The treehouse has no plumbing. No fancy tiling. We used a drill and screws for the majority of the connections. I based much of the work on playsets I have built in the past using lumber and instructions from local hardware stores like Home Depot and Lowe’s. I use a ladder to reach much of the initial work. 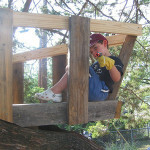 Once the frame was complete with a few cross boards, I was able to finish the build from within the treehouse itself. Thank you Marcus and enjoy your treehouse!